Anthonie W.M. 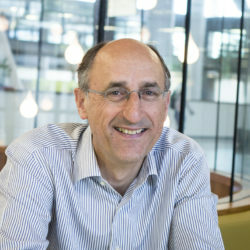 Meijers (1953) is professor of the philosophy and ethics of technology at Eindhoven University. He studied mechanical engineering (Delft 1978) and philosophy (Utrecht 1987) and received his PhD in philosophy at Leiden University (1994). His dissertation was on the foundation of Searle’s theory of speech acts in his theory of mind, for which he did extensive research at Berkeley. Anthonie Meijers ‘s research interests include: the theory of artefacts, agency and artefacts, the epistemology of the technical sciences, ethics and behavior change technologies, and the theory of collective action and collective intentionality. Anthonie Meijers is co-founder and since 2005 editor in chief of the international journal Philosophical Explorations. He is the editor of the handbook Philosophy of Technological Sciences. This handbook is part of a 14 volume series in the philosophy of science, published by Elsevier Science. Meijers, AWM 2008. Philosophical explorations 11 (1-3). Kroes, P.A., and A.W.M. Meijers, eds. 2006. Introduction: The Dual Nature of Technical Artefacts. Studies in History and Philosophy of Science, vol. 37, issue1, 1-4. Meijers, A.W.M. 2005. Criteria for Academic Bachelor's and Master's Curricula. Paper read at CESAER Workshop, 30-06-2005, at Darmstadt, Germany. Meijers, A.W.M. 2005. Towards a European Qualifications Framework. Paper read at CASEAR Seminar Change of Paradigm from Input to Output, 28-10-2005, at Lisbon, Portugal. Meijers, A.W.M., C.W.A.M. van Overveld, and J.C. Perrenet. 2005. Criteria for Academic Bachelor's and Master's Curricula. Eindhoven: Technische Universiteit Eindhoven.